Provence is a beautiful rambling region in South Eastern France, encompassing the beaches of the French Riviera and the seaside towns of Marseille, Nice, Bandol and St Tropez. The region was one of the first provinces outside Italy to be occupied by the Romans who named it nostra province- ‘our province’. The countryside is a charming landscape of low, rolling limestone hills covered in dry scrub and characteristic sun baked earth. The sun fills the air, bouncing off the sea and the land, creating a relentless light that has captivated artists including Van Gogh, Cezanne and Renoir. This incessant sun is combined with the cooling wind from the north, le mistral, to create a dramatic climate. Tough, shrubby plants and olive trees thrive here, as do grape vines. The best vineyards of Provence are tucked into hillsides, facing south so avoiding the full force of le mistral, and produce some distinctive and delicious wines. To many Provence is far better known for its food, and its landscape, than for its viticulture, but the region is emerging as a producer of serious wine. The reality is that the culinary tradition, the land and wine are inextricably linked: two parts of a whole. The wines of Provence are at their best when enjoyed with the wild flavours of herbes de Provence, richly garlic-infused Aioli, and locally caught fish. Provencal wines that may seem pedestrian when drunk on their own miraculously come to life when paired with the sublime local cuisine. The finest wines are said to smell and taste of garigue- the characteristic scrubland growth that covers the hills. The most popular and best known Provencal wines are zesty roses, and there are also delicious deep reds. There are four significant appellations, all in the south on the Mediterranean: Bandol, the most respected; Cassis; Coteaux d’Aix-en-Provence; and Cotes de Provence, the largest appellation. Bandol, in the hills between La Ciotat and Toulon, is one of the oldest vineyards in France with a wine history stretching back 2,500 years when the Romans planted the first vines. With access to the port at Marseilles the speciality Bandol reds have long been world famous. Bottles from here could be found in India and Brazil over 200 years ago. The dominant grape in Bandol is ‘mourverde’, which by law must be at least 50% of a wine’s contents, and is often 100%. Bandol red wine is one of the best from Provence, producing delicious drinks that are deep, wild, leathery and spiced. There are also excellent dry whites made here. 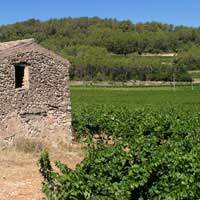 The wines of the Coteaux d'Aix-en-Provence are mainly dry rose and red wines. Co-operatives are important here, making blends from Grenache, Cinsaut, Mourvedre and the local Counoise. Cabernet sauvignon is also used, which is very surprising since it is not a Mediterranean grape and is rarely used in other parts of Provence. Cassis is a fishing village along the coast, and while small it is a popular and charming appellation. Cassis is famed for its white wine, with a slightly nutty flavour, and golden straw-colour, it is delicious paired with local seafood dishes. The blanc de blanc is especially fine.Côtes de Provence is not a single place but rather many large tracts of vineyards. Climate, soil, grapes and technique all vary enormously but share one common factor: huge amounts of sun. These variables are reflected in the differences of quality found in wines from this appellation. Half of France’s rose is made in Provence, and 80% of the wine made in Provence is rosé. Rosé de Provence is typically dry and fruity, ideally suited to the Mediterranean cuisine. Particularly magical is the pairing of a snappy, bold rose from Cote de Provence with bouillabaisse, a local speciality fish stew which is infused with saffron and served with garlic and pepper-spiked mayonnaise. Whereas most wines would find it hard to match these powerful flavours, these roses provide a match made in heaven! Provence is one of the world’s most bewitching wine regions, beautiful landscapes filled with charming vineyards to explore, exquisite food to taste and delightful wines to discover.Provence wines go well with Picadon, Pelardon and Feta cheese.